I watched a programme on Discovery Channel some time late last year. A scene from the programme caught my eye. It was an aerial view of a wind turbine farm off the coast of Denmark. There was something so cool and majestic about seeing pure white wind turbine towers rising out of a deep blue sea. 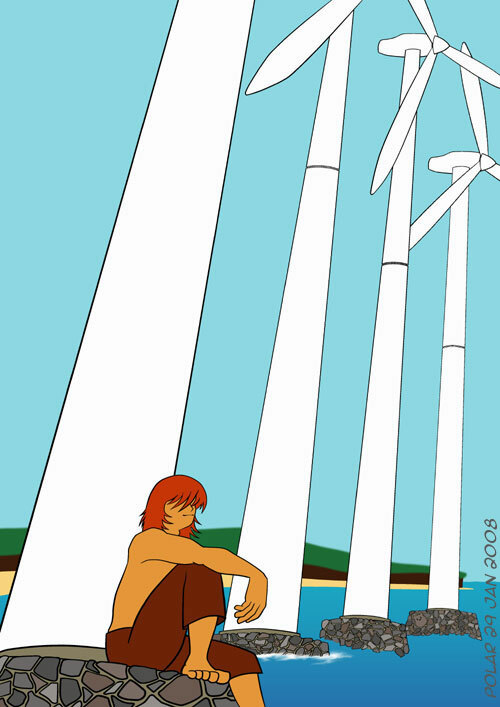 I liked it so much that I decided to draw a wind turbine picture. 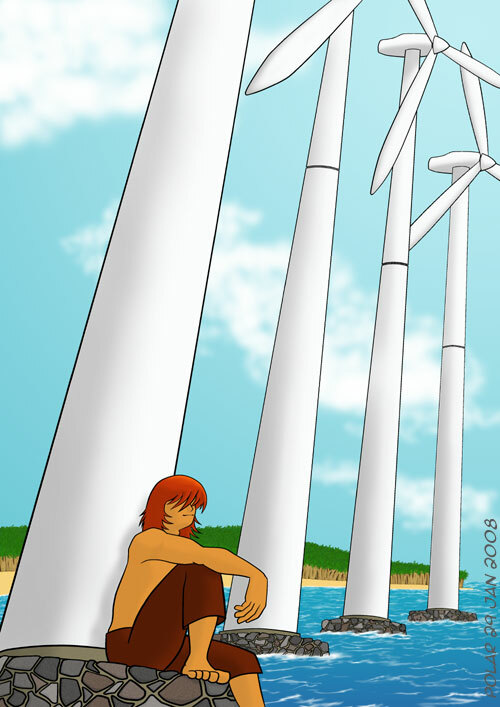 I wanted to show the massiveness of the wind turbine so I added a human as comparison. I decided to arranged the wind turbines in a row, instead of a grid as in a real wind turbine farm, for aesthetic purposes. 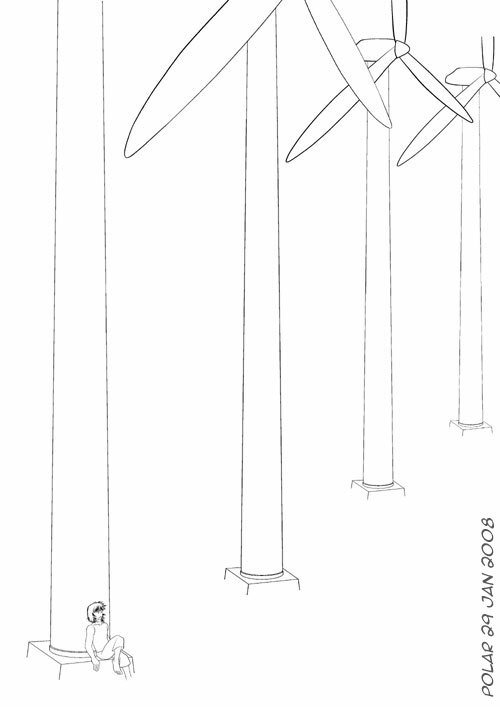 I looked at a few pictures of wind turbines to refresh my memory and to check the shapes of the blades. But when I started drawing, I did not refer to any pictures. I felt that it doesn’t matter if the wind turbines were not very realistic. After inking the picture, I took another look and decided that it looked boring. So I drew another version. This is the 2nd version I came up with. I changed the perspective and the posture of the human, but otherwise all the elements remained the same as the previous picture. I’m pleased with this picture. It looked more dynamic and interesting than the previous one. Then I ported the picture over to photoshop and started colouring. First, I added the base colours. It took me some time to find the exact shade I want. I always feel a bit lost when I had to deal with colours. The flat colours looked a bit static so it’s on to the last and most time-consuming step. Here is the completed picture, after I’ve added shadows, highlights and more details. I’m glad that I had decided to invest in a graphics tablet. All in all, I took an estimated 1 and a half months to finish this picture. Hey, it’s completed! congrats! First time I’ve seen this picture colored..and wow, I really like it! =) something about the bright colors and the sunny sky. And something about how it feels both happy and peaceful- like one of those lazy afternoons ^^. Big thumbs up! HI. The pictures you draw, very impressive to me. I am wondering could i use the picture for my personal email signature? Hey, thanks for all the help. I really needed it, It’s for some bonus in my science class…. it is so dumb. But I could use the extra credit.